One of the most versatile, intelligent and abundant of all ungulates, this prolific breeder is the mainstay of a number of predator populations across its range, especially in northern climes. In fact one race of the tiger, the Caspian or Amur tiger is supposed to have subsisted on this species through much of its range. 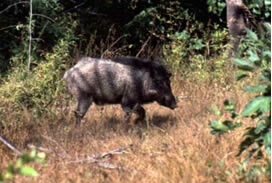 Adult boars are covered with stiff, coarse black and brindle hair with a thick crest from the nape and reaching down the back. Adult males have well-developed tushes (canines), both in the upper and lower jaws. These curve upward and protrude out from the long snout, giving them quite a formidable appearance. This razor sharp dentition is used both I internecine battle as well as in defence against predators. Females are more brown and smaller. Newborn piglets are brown with light or black stripes, and a favourite prey of Leopard. 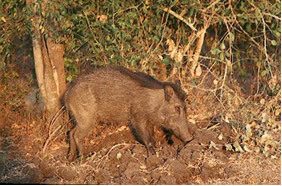 The Indian Wild Boar has a wide distribution through India, Nepal and Sri Lanka. A sub species is found in the Andaman & Nicobar Islands, the Andaman Wild pig (Sus scrofa andamanensis). The species enjoys a much wider range stretching across Europe and Asia. and can return an area of groundnut or maize or potato to ploughed field within a matter of hours. In the words of M. Krishnan "A groundnut field visited overnight by pig, looks like it has been freshly ploughed up." Wild boar have a keen sense of smell, but their eyesight and hearing are not that acute. They produce an assortment of sounds, with the most commonly heard one being a grunt emitted when the animal is surprised and while making a quick get away. They are prolific breeders and breed throughout the year. Females start breeding at a very early age. Males generally disassociate themselves after the breeding and live alone or with other males of similar size. After a gestation period of 4 months, a litter of 4-8 piglets is born. Omnivores that can extract a fairly comfortable living from a wide range of resources, they are a pest for farmers and were considered vermin fit to be exterminated. Fortunately, the blanket ban on hunting has provided a reprieve for this heavily persecuted animal but it has to be said that their numbers have come back strongly much to the dismay of the farming community.